Yesterday, I listened to a friend express her frustration with the commercialization of Christmas. After years of keeping up with the gift giving flurry she decided to make 2014 the year that Christmas did not drive the family further into debt. After detailing how she had frugally transformed Christmas gifting this year, she went on to passionately reveal a deep longing to personally transform the concept of gift giving for her family. This year she has crafted and assembled most of the gifts that will be passed to the children and adults in her family. The gifts she will offer are thoughtful and engaging. Personalized ornaments and scarves are just a sampling of how she has managed to keep the Christmas budget under $60. She ultimately longs to transform holiday gift giving into an act of generosity. As you can probably guess, that’s where she sold me. I’m not crafty…you’re not going to catch me sitting at my kitchen table hot gluing ribbons to my fingers…I’ve learned my lesson. I, myself, do not actually do a lot of gift-giving for holidays and birthdays. When I became aware that I had hit a socioeconomic level that did not support my ability to give to everyone, I limited who received gifts. I admit, it did not feel great to be in that position. With gratitude, I want to share that I am blessed to have a family that extends grace and acknowledges that debt accrues more negative consequences than the interest paid on feelings. Prior to Thanksgiving, I felt the raised eyebrows from friends when I proclaimed that this year I’m only giving one gift to each of my children. I’m still wondering if I will be able to pull that off…but it is worth the try…again…you see, I think I said that last year… I knew exactly what my boys wanted, one wished for a Cozy Coupe, the other wanted a sled. Then I justified buying numerous practical gifts because they needed new cups, crayons, paper, puzzles, books…action figures. All of that practical stuff really added up quickly. Surrounded by marketing it is easy to get swept up in getting a good deal during the Thanksgiving Day/Black Friday/Cyber Monday madness. Having removed a significant amount of marketing from my eyes during my social media fast in November, I found it fairly easy to avoid the frenzy this year. My desire for financial peace managed to win over my hunger for a new laptop. My friend described all the money that could go to a good cause if at least adults would choose to give to charity as opposed to each other. If I were to give every sibling, parent, aunt, uncle, cousin, and their children a $10 gift it would cost me well over $100, just to give gifts on my maternal side. Multiply that action by 10 adults and then you are talking about $1000+ in social change. Also, the great thing about donating $10 to a charity–is that the money tends to go a lot further in their hands. Giving could actually be rather simple friends, research your chosen charity, and give your little heart out. My friend and I are not the only people who feel this way. There are movements for generosity that encourage #SelflessActs for the holidays and beyond. I hope that you are not so exhausted from Cyber Monday that you miss out on #GivingTuesday. Whether you choose to volunteer your money or your time to a cause you care about…I think that these type of movements should be most supported by those who know that loving your neighbor is a command. Families and communities united together for social change, I can’t argue against it. Last night, interestingly enough, I found my charity that I wish to support this December. I had the privilege of watching a documentary on Netflix, Alive Inside. The film poignantly reveals the success that social worker Dan Cohen has had with using music to access the memories living inside of people who have been diagnosed with Alzheimer’s and other types of dementia. The Decembers of both my maternal and paternal grandmother’s lives were interrupted by disease that left them trapped in their own bodies…alive inside. We spoke to them even when they did not recognize us…we prayed, hoped, and cried through years of strokes and Alzheimer’s symptoms. I remember one Christmas as my dad sat next to my grandmother in a Santa Claus costume. He asked her, “Do you know who I am?” I remember her big smile as she hit him and said, “You’re Santy Claus”. He laughed with her, but it was impossible to ignore the tears in his eyes as he longed to be called son just one more time. Merry Christmas family! 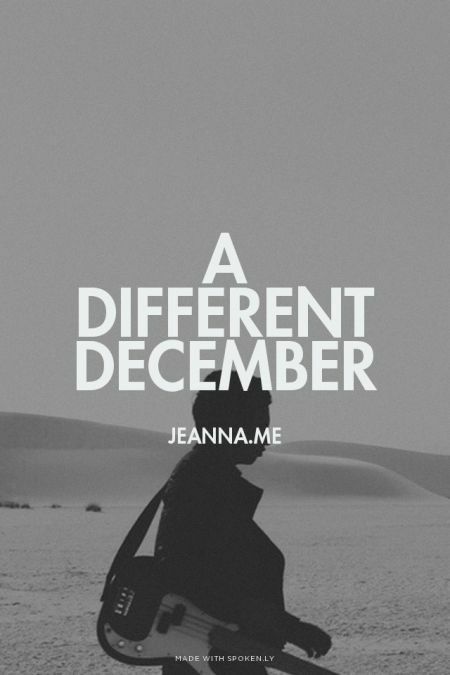 You’re giving/getting a “Different December” this year.